This trip started by seeing a mention of it in Flimsies and armed with the information needed I called the City of San Luis Obispo Chamber of Commerce for a ticket. I called the Budget Motel for a night's stay and got an Amtrak round trip on the Santa Barbara San Diegan with the Thruway Bus to San Luis. So on May 5th, 1994 I took train number 771 up to Santa Barbara then transferred to the Thruway for the rest of the trip to San Luis Obispo. I walked and got checked in before returning to the station to watch both Coast Starlights pass through town. I went and shot the 2472 just before the rains hit and took shelter as this first band of rain passed. 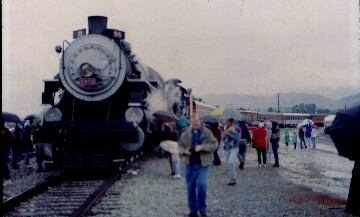 The train backed down to the depot and loaded its passengers. The reason the 2472 was in San Luis Obispo was to help celebrate 100 years of that city. The excursion train with the Daylight train was to be one of the highlights of that event. We left at 4:00 PM as the rains started to fall again. We headed southeast out of town through the SP yard located here. After a few miles, we crossed the Corral de Piedro and entered Price Canyon. We snaked our way through the canyon with the 2472's whistle echoing off the canyon walls. We ducked under Highway 101 before entering Grover Beach. Off to the right you could see the Pacific Ocean. With the Sand Dunes to the west, we traveled through Oceano before climbing the short hill out of the Cienga Valley with Celery and Whoa Lakes below. We crested the grade with a tank farm on the left and entered the Santa Maria Valley. We crossed Oso Creek, went across the rich farm land until we crossed the Santa Maria River and entered the town of Guadalupe. At the south end of town, the Santa Maria Valley Railroad took off to the east as we started to climb the Casmalia Hills. From the location of Waldorf looking down into the Santa Maria Valley I could see the Holly Sugar Plant at Betteravia. We climbed the grade between the hills to Devon before turning west down Shuman Canyon with the Casmalia Hills running northwest to Point Sal. We turned south up onto the San Antonio Terrace with the sand dunes to the west with the Pacific Ocean just beyond. We passed through Narlon then crossed San Antonio Creek. We climbed onto the Burton Mesa to Tangier which is located just east of Point Purisima on Vandenberg Air Force Base. 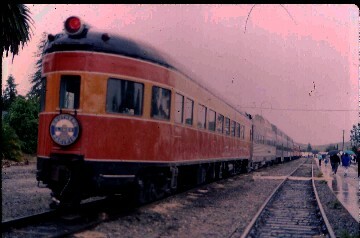 Here we wyed the 2472 and train for the return trip to San Luis Obispo. We made good time back arriving just after dark finishing a very unique trip with the SP 2472. I walked back to the hotel stopping off at a liquor store to get a supply for the night. 5/8/1994 The next morning I was up early and walked back to the Amtrak Station to take the Thruway Bus to Santa Barbara and the San Diegan for home. I finished up my first year at McFadden.